Yes, it’s cold out right now. The cold and winter sports can be rather intimidating if you’re not used to them. Jill Brown and I want to help you get outside and enjoy the brisk weather right away! 1. Dress Appropriately. Add a layer. Use your kids’ regular winter coats and just add another layer underneath their pants and long sleeve shirts. I like to have them wear those tight fitting cotton pajamas underneath everything. Snow will melt so it’s best to have an outer layer that is water resilient if the winter coat isn’t. A rain coat for up top and some athletic pants down below can do the trick. 2. Mind the elements. Be sure to keep kiddos’ gloves on. They will be so excited to touch the snow they will forget about how cold it is. Prevent the meltdown and avoid snow-to-hand contact! 3. Start small. Try snow play first then add sledding. If they like those activities then they will probably enjoy skiing. 4. Find the best location. Ask around about fun snow places in your area. Visit forest service websites. Or try calling a local sports shop. 5. Keep everyone hydrated and fed. Higher elevations can be taxing so make sure kids have plenty of water to drink on the way to the snow and bring their favorite snacks to munch on. 6. Understand Safety issues. Safety first, always. There are some risks involved with snow play. But like most sports go over the rules with your kids and keep an eye on them. When sledding, make sure you sled in an area without obstacles (trees, rocks, drop offs) and you teach kids how to use their feet to stop the sled. 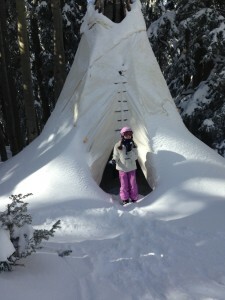 Note that snow can be deep around the base of trees. We call these tree wells and they can be tiring to get out of for a little kid. 7. Budget reasonably. Snow play in itself is rather inexpensive. The main costs are making sure you have appropriate layers and the gas to drive there. Gloves are key but you could use a plastic bread bag with a rubberband over regular cotton gloves in a pinch. Other cost might be purchasing a sled, which can be found in second hand sports stores or possibly borrowed. Cardboard can also be repurposed into a sled. 8. Adjust expectations. Your kids may or may not have fun in the snow. Most likely they will have a blast but keep your expectations in check just in case they don’t. Know it might take three times before everyone finds their groove (including you). 9. Practice Patience. The key to snow sports is patience. Everything about it takes longer: getting dressed, undressed, using the bathroom, walking, loading into the car, etc.. Make sure you anticipate that it will take longer for you to get prepared let alone your kiddos. As long as you keep this in mind you’ll be good! 10. Enjoy ALL the fun and benefits. Going outside is good for kids! Health benefits include exercise, vitamin D production, and a boosted immune system. Plus, outside play stimulates children’s’ brains by encouraging imagination, creativity and problem solving. Jill Brown is a landscape architect, author, and blogger who provides landscape coaching to homeowners to help them enjoy their yard. As a mom of three boys and promoter of outside play, she is a pro at getting her family out to play in the snow. Together we collaborated on this list of ways to get out and actually enjoy the cold and snow THIS WEEKEND. Check out our list AND Jill’s awesome landscaping tips for busy moms at www.mylandscapecoach.com.